Wishing Casey the best for the future. Casey came to visit again tonight, probably for the last time. By this time next week she may be already adopted. She's got somewhat used to cats but is having big separation anxiety problems and if she's going to get through that and come to trust people they should be the ones who will be there for her for the rest of her life. I think we'll be talking about her and my kids will be pretending to be her for quite some time yet though. I warned each child that we might not see Casey again. Iris had a tantrum. I can't remember her last one, mostly she hasn't lost it much since she was able to face forwards in the car, before that we were avoiding car trips because she was so very very loud about facing backwards. Tonight she cried herself hoarse and was still sobbing as she finally fell asleep in her dog basket. The dog basket and tantrum combination was partly a desparate urge to do some work on her enclosing schema and partly grieving over a dog. Hazel wouldn't say goodbye, she told me to get the address where Casey is going to live, write it on a piece of paper, drive to the number, check the piece of paper and go in and visit Casey. Me, I thought I'd get a chance to give her a stroke and some good wishes but I didn't hear people getting ready to leave until Tam, Stephen and Casey had gone, so I shed some tears. It's the loss of all the potential of the brief relationship that gets me. The relationships I most regretted the ends of were short enough that I felt I hadn't even had a chance to play before my friend packed up his bat and his ball and stormed off home over some minor disagreement of rules that we could easily have sorted out with a conversation. I cried the hardest over Halley, the fish that died two days after I got it. Before I went out yesterday Iris was asleep and Hazel was draped over me, silky head under my tilted cheek, as we made up a story (Hannah and Flora have got to the African exhibit on the zoo planet that orbits Alpha Centauri and are enjoying flying with the brightly coloured flocks of parrots). I was not surprised when she didn't want me to leave for role-playing, it was rather detached of me to wish to tell stories with somebody else and she has a romantic nature. She came out to wave to me and I pointed out a pink camellia bud growing by the path. She called me back to present it to me but I didn't understand and merely waved. Hazel was terribly sad and Sean had to send me a pxt of her with the pink camellia and an explanation before she could move on. When I returned the pink camellia was waiting by my place at the table in water. I was forgiven. It bloomed as wide as the smile of a child today. "I run on grass, my white dog run on grass, we run and run. I crash, my white dog crash. I run on grass, I walk my white dog on the path, I hold my white dog's lead." "I know, I get my purple spade, I pick up dog poo and put it in a plastic dog bag." "You'd pick up the yucky dog poo?" "Yes, I get my purple spade. My dog, my dog poo." Born to run. Born to socialise or learn? Casey (whose racing name was Chatham Lass although that link doesn't think she did much racing) was pleased to see Iris and Hazel and accepted their adoration and the present with kind grace. A while later Tam and I took four small children and one white dog up into the misty paddock and Tam and a friend got Casey to run. At first Casey was a little confused about what we wanted "They can't want me to run, it's not flat, there's no other dogs, I'm not wearing my special face thing... they seem keen though, I'll do a bit of running and see what they think... oh, that was successful, they're calling me a good dog and asking me to do it again... oooh, now I think about it that was wonderful, I feel great!... great!... great but tired. I guess I'll stop." It was lovely to see her joyfully flying up and down the hill. I asked Iris what she thought and she said "Casey good running, big running, good big huge running! Fast!" Our playcentre is really into considering the children's schemas when considering their learning. Schemas are a way of talking and thinking about repeated thought-patterns in children's play. We find this way of thinking helps us to interact with our children because it seems they repeat these sorts of patterns because they are passionately interested in them. When they are passionately interested in something they are deeply engaged and that's when they learn the most. When we come to the children willing to listen and talk about the things they are passionately interested in, they are often willing to talk and listen to us too, which means we can support and scaffold their learning easily. Hazel and Iris have trajectory schemas. They each have some other schemas as well but they are both deeply fascinated by things moving fast. The trajectory schema is common ground for much sisterly bonding and Casey is an embodied trajectory; everything about her suggests her potential for speed. They watched her run as if it were an exam or a revelation. Their interest in Casey has had me helping them find pictures of dogs of different breeds and talking about each breed's history, we've looked at dogs and talked about the differences and similarities between them, we've guessed at whether they're fast or strong by looking at the outward evidence of their biology. Iris is trying her hardest to get exactly the right words to express her admiration for Casey's speed and grace, and Hazel has been thinking about how she might seem to Casey, who has very different ways of thinking. This holistic, continuous self-directed learning is obviously good for people and it's exactly what Te Whaariki (the early childhood curriculum) is about. But Hazel is 4, and it is normal to go to school at 5 in New Zealand. I quite liked primary school. I still have some friends from then, and somehow I've managed to turn "you think you're so smart" back into an affirmation over the last 20 years. But I think I might have been smarter if I'd not gone to school. I remember having a huge vocabulary ready on the tip of my tongue for every occasion. It was not an asset, so I decided to pretend to forget the word whenever I was about to use one I didn't think my schoolmates would like because it was too long and latinate. After a few months that forgetting became real. School never supported me in researching something that I was passionately interested in. Some of the assigned projects did seem more interesting than others but it was made very clear to me very shortly after starting that there were about 30 people in the classroom and that in order to get along as well as possible with 29 of them it was a mistake to impress that last one. School never gave me the impression that I should try stretching myself, that giving it my best shot and failing was better than not trying, or that outstanding success was better than fitting in. But I'm happy now. I have a lovely family and wonderful friends. If I hadn't been to school and made those trade-offs would I have managed the social successes that are what really make the difference between loneliness and joy? I'm sure my children are ordinary enough that they would do okay at any school. I believe our local schools are all quite good, as schools go, one of them even has a Montessori strand. But if it were as easy socially to choose home-schooling as it is to choose to bake all your own bread it would be an easier choice. As is I feel we're making the choice again for Hazel I made for myself as a child: and so I'm asking myself, with all the clarity of hindsight, is it better to be very clever or almost normal? The dog adoration co-op is gearing up for seeing Casey again tomorrow. We've got her a present of a ball on a string for further throwing and Hazel's written "Casey" on a sticker. Both girls have been pretending to be her too "You can be a little Casey, Iris." "No, I bigger one!" Today we met Felix and Fergus (above) going for a walk, who were considered very fine if not quite as perfectly sleek or white. Hazel told me their 3 year old owner has the perfect life. Not because she has enough ice-cream, no, we have matured and our requirements for perfection are more complicated now; it's because she has two dogs and a cute baby sister. Meanwhile our poor cat is wearing a clear conical collar and hates it. He had a bite and an abcess that has had a drain inserted. A white greyhound with little spots is visiting us tonight as part of learning her new job. Casey used to run like the wind, now she's being fostered as she learns how to be a pet. Hazel and Iris are in love, but finally asleep. "Pee and poo on grass," and, after a pause for thought, "very beautiful fast dog Casey." "Get a dog, my dog, very same kind dog as Casey." "I five, my dog, very same kind dog as Casey." "If we had a dog," I said uncommittingly, "it would be everyone's dog, Hazel's dog too." "No! My dog! Hazel have baby sister." "Oh, so you have a dog and Hazel has you." "No! Hazel have baby sister." "Aaah." I said, even less committingly. "I would love a dog even more than a baby." Hmmm. An ex-racing greyhound would be someone to be proud of, but they need thoughtful understanding because for thousands of years they've been bred and socialised to go f'tannng! and be gone over the horizon after something small and fast; you can't walk them off the lead or tie them to anything. I've been reading Parker Palmer's To Know As We Are Known: Education as a Spiritual Journey ("To teach is to create a space in which the community of truth is practiced.") and Michael Lawrence's Maggot Pie ("There was this tradition in our town that if a boy weed in the Piddle Pool the night before he started in the Infants he'd have a lucky school life.") while watching the first two episodes of the 1981 BBC Brideshead Revisited ("I thought you were dying." "I thought so too.") Together they have reminded me of how very varied is our experience of communities within educational institutions. We borrowed our eldest niece for the afternoon. 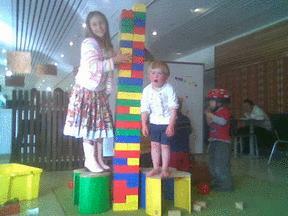 Here she is building a tower with Iris at Te Papa. Around that point things were clearly going so beautifully I negotiated borrowing her for the night as well. She can read which is just such a bonus at bed time. And Sean was going out. "I wearing a dress like Dad... You a pirate Daddy? I a princess Iris." "He's going out to play dress-ups with his friends." "I love to play dress-ups. What is he, a prince?" "Yes. A somewhat japanese space prince in fact." "Oh. Well he sure looks like a prince...cess!" (Yeah well, she is only just 7). Bonus extra photo just because I liked it when I was uploading the Tower one. 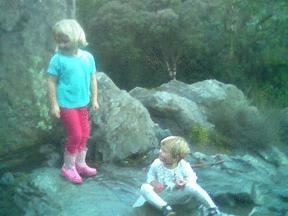 Hazel and Iris on wet rocks a few days ago. 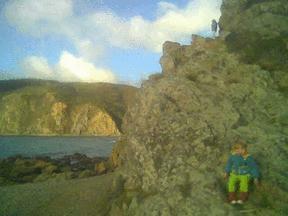 Rugged rock and some ragged rascals, a bright sky and windblown sea. The tiny purplish grey dot up the top right against the sky is Hazel and the green trousers (befouled with urine, ashes, sand, and brine) are Iris's. We were at Makara beach where the wind takes all words of warning out of the mouths of the mothers and dashes them against the crumbly rocks. What can one do but take a picture? Oh, and below is a picture of Bryan Ferry. My character Georgei Vorkovacs looks like him. How they used to catch the now rare kakapo. Method for birds of prey (the predators that evolved alongside the kakapo): Look for a kakapo. No, you won't see it, it's sitting very very still with its eyes closed and matches the bush beautifully. Method for cats, dogs, stoats and other introduced mammalian predators: Smell the kakapo. Wait for it to sit very very still with its eyes closed. Method for humans: Go up to the bush a kakapo is sleeping in. Shake it. Pick up the kakapo that fall out. Sean's best friend is large and fairly furry for a human. He likes bears, identifies with bears, and now is evangelising ursophilia. He's given our children giant teddy bears, one each. And teddies of this vast size for a fair number of the other children of friends of his. I don't know whether all the other parents are having trouble fitting the giant bears into the small beds of their offspring or not, but I'm sure their children are just as cute when dragging giant bears around the house as mine. Sean's birthday was yesterday. I gave him Firefly on DVD, which I will enjoy watching with him. Hazel gave him Alice in Wonderland and Through the Looking Glass with the original illustrations, which she will enjoy having him read to her. Iris gave him The Penguin Natural World of New Zealand by Gerard Hutching which he will enjoy reading to her. Today was Mothers' Day. Hazel commanded I breakfast in bed and so I did. Side-tracked I found a familiar laundry system. But now I'm a grown-up household executive mother of two is it any different? If it is child sized and not undies, what smells clean and looks clean is clean enough. If it is adult sized and on the floor anywhere but beside the dryer, it's dirty. If it's in a laundry hamper, it's dirty. If it's near enough a laundry hamper that someone probably was aiming at the hamper when they threw, it's dirty. If it's behind the door, it's dirty. If it's somewhere other than the laundry or laundry basket and wet, it's dirty. If it's undies and alone, it's dirty. Anything left on the toilet floor after toileting is probably dirty. If it's smelly, it's dirty. If it's on the floor by the dryer, in the laundry basket, folded or put away, it's clean. If it's in a bag it is indeterminate. Is it wet? Is it smelly? But like the cat says "All you have to remember is Rule 1: When in doubt - wash."
At least enough to remove the shoes. We've had painters since the end of February. They haven't yet started painting. We are well into Autumn. They've found some rot and rust and have been fixing that first. They've only had one person on the job much of the time and it's a big house. The first one quit (perhaps being put to prep a big house all by himself was a bit depressing). Despite lovely weather the last two days his replacement hasn't been around. Sean rang the boss this morning. Turns out the replacement was arrested on the weekend and hasn't come back to work. There are so many crimes, and even if the person's guilty most of them are irrelevant to us. But painters need access to our keys, are on good terms with our children, and know a lot about our habits and possessions. So I'm using the burglar alarm, locking the doors, and keeping my phone at hand. ... later ... The police, while rightly unable to tell me anything about a person's arrest on the weekend, did say that "nothing leapt out" as suggesting that it would be wise for me to avoid being home alone with the children. Which is a great relief, property is property but persons are people. Ingredients of the village to raise a child. home: when we have to go there they have to take us in. Adults must demonstrate a range of successful ways of being (get extra if needed). 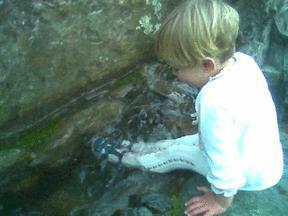 Other children must be varied enough to learn from, to teach, and to have changing or life-long alliances with. Try for an integrated recipe for being, allow for variations in cooking practice. Maybe I should get a vase for that Iris. "Mum look at me! I up in here, you talk about it. 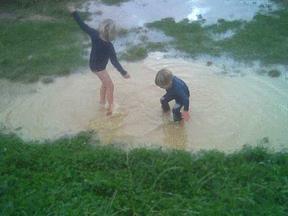 Uh-oh my warm dry trousers all wet". Having the tools ready for the job. Sean says he looked pretty good in front of the guys yesterday. They moved a gigantic heavy server rack and to do so they had to take its insides out. He popped in to the house and came out with a socket set and crescent wrench. They needed to do something else, in he went and out came the screwdriver set. None new, all items present and organised. "Guys just like to have the right tools in front of other guys." "Oh, you might think that guys like to have the right tools in front of other guys but you haven't seen smug until you've seen a feminist who's producing the right tools in front of other feminists. The ideological background gives it extra weight." (I'm having a colposcopy today. Expecting good news but some kind of deep terror lurking nonetheless... later ...news as good as possible at this stage, got to wait for the smear result to be sure). Chloroclystis filata and the bear umbrella. Since Dead Wasp went to Te Papa and we saw her in detail Iris hasn't had her in bed with her. Tonight on the way to brush her teeth Iris spotted a moth on the floor. We looked at it for a while and then she very importantly bustled off to get a pot to put it in. She found the pot that had been Hazel's Caterpillar's home and we got the moth in. She rushed off to show Sean and Hazel, who were satisfactorily impressed. Then we had to get Our Insect Book (as Andrew Crowe's Which New Zealand Insect is called around here) put our glasses on, and pore over it comparing the pictures with the moth. It's a 2 cm or so wide stripey brown moth with a stripey brown body whose stripes connect up with the wing stripes. Its head has a little point. It's antenna are not fluffy nor do they have fatter bits at the end. After quite some time we allowed ourselves to leave the moth and went to brush our teeth. Hazel kindly went and put the moth in its pot on Iris's pillow and Iris and I took Our Insect Book to her room to read before bed. She looked and looked and we talked about lots of stripey moths' fluffy antenna and smooth round heads. Finally we found the Australian Pug moth (every time I type that I spell Pug with a final 'b'), Chloroclystis filata, who came here of its own accord in the 1960s and is now common all over New Zealand. It likes gorse and kanuka (I hope it won't die of starvation in one night but it's rather wet and dark out there). "Yes, that one, Austral-li-lan Pug one, my moth!" I had just started re-hashing the investigative process in a triumphantly pedagogical kind of a way when I noticed that Iris, one hand on the moth's pot, was already asleep. I gently removed her glasses. My work there was done. I heard the front door open so I popped in to see Hazel who told me that Sean was out in the rain getting her umbrella out of the car for her to sleep with. "Isn't it a bit silly to sleep with an umbrella?" I asked as politely as possible. "Not when it's a new teddy one!" she replied almost without patronising me. When I was a little girl my father was already trying to bend computers to his will. I used to call the typewriter in the Maths department storeroom "Teddy's 'puter". I enjoyed unfurling rolls of computer tape down the stairwell in the Rankin Brown Building and my father sometimes set me up to use a terminal near his to write things we could print out later while he was using the big computer. I tell you, that computer was big. It had presence, it filled a room, its lights twinkled and it really gave the impression of working. It would work all night on maths for my father. But now we live in the far future. I can tell; I was doing a bit of tidying and I found a gigabyte of memory under some tiny undies and a pair of strap-on angel's wings. It was not the size of a city block, it did not fill a room, it was more choking-hazard size and I'd forgotten to pop it into the pda. Things keep coming up that make me consider how wierd a parent do I want to be. I'm giving a talk at Rainbow In My Head (a day of ECE workshops) with a friend about Attachment Parenting (happy babies are being cuddled, why not just keep cuddling them). We both came to attachment parenting by seeing child-led holistic learning is just the easiest and best way to deal with other people's pre-schoolers and then having our own. As part of my research I'm reading The Continuum Concept (stone age amazonians do better parenting by being available for their children but not making them do anything really). Last night I sat in Te Papa's cafe and talked de-schooling, home-schooling and un-schooling with subversive teachers. Someone mentioned Philosophy for Children (in which the philosopher is merely a more experienced thinker rather than a bank of knowledge that the children make withdrawals from). I did consider becoming a philosopher for children after I first heard about the movement at the Philosophy conference in Wellington in the middle of my Masters (1994?) but at the time I thought I'd get a PhD, teach adults and earn more, although the people who learnt about Philosophy for Children at the same time as me said I ought to do it because I'd be a good one. I don't really have a desire to do a PhD these days (though I'm making no promises about the future) but I do have children and I think that classrooms might well be improved by the movement and so I'm considering again doing a workshop to find out what Philosophy for Children really entails because even if I'm not going to unschool my children perhaps I'd like to de-school their classrooms a bit. And meanwhile Iris is getting used to her glasses (she requested that no-one talk about them at Playcentre today, they didn't and she wore the glasses happily most of the day) but they are quite a change and she's breastfeeding more to offset the stress of having something so grown up attached to her face. I must get a photo for Aroha (La Leche League New Zealand's magazine). It just goes one logical easy step at time and in no time one finds oneself travelling all over with eight children, of course, she's younger than me and got a head start on breeding. 10 signs of susceptibility (risk factors) for a child to develop high to moderate myopia (short sight). "There may be no measurable myopia yet but the child behaves like a myope. A characteristic sign of this is a relatively close reflex reading distance and/or a tendency to move unusually close to objects of interest. As a pre-schooler the child already likes picture books and explains the pictures. The child is good at jigsaw puzzles. As a school child he or she is a good reader and likes to read. The child is a good student. The child reads a lot even under poor lighting conditions. The child complains of no visual fatigue. He or she can do close up tasks as long as they like without getting tired. The visual examination shows good visual skills e.g. accurate eye movements, good binocular vision, good discrimination skills. 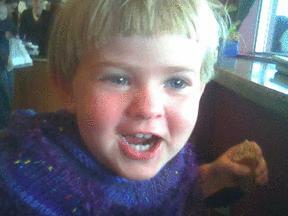 The child has no developmental or visual-motor deficit. 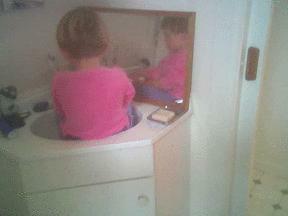 The child is normally active. He or she can sustain a meaningful motor activity. There is no hyperactivity. The father and/or mother are myopes." (Quoted from David Aldridge, personal communication, 4 May 2006). My father and Sean both have short-sight and Sean's was pretty poor by the time his compensating mechanisms failed enough that anyone could pick it up. So Sean and I had planned to get the girls' vision tested whether or not we had any worries about it but it was number 1. that sent us to the optometrist. She behaved in a myopic way: before she was a year old Iris would get inside the range that I at 35 could focus to, as soon as she could do a pincer grip she picked up small things and held them 4 cm from her nose, she puts her face on her work when she draws, and Iris wouldn't recognise people from as far off as Hazel and I would. Now we're watching for the absence of these behaviours. This morning a friend of Iris's who also has new glasses visited. The friend is very good about wearing them all the time she's inside and told Iris "wearing your glasses is important" but Iris isn't completely sold on the idea, I hope it's coming though. I've only seen her behaving short-sighted once today and that was when she was tired and a bit cross. 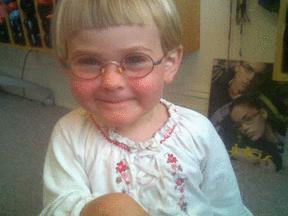 Iris was willing today, if not yet happy, to wear her glasses for books, and watching a DVD. She has moments of being quite proud of them and she's asleep with them again tonight. I haven't yet grokked the muscular relationship between the genotype programming the physical reality of the shape of the eye and behaviour doing the shaping of the phenotype but my friend Anne says she has two cousins who wore corrective lenses for a little while in childhood and not since; cousins of a friend--it must work! Iris has glasses. She looks very grown up and sophisticated in them and has gone to sleep clutching them in their case. Hazel says she would like to have glasses too. We went to the children's optometrist in Kilbirnie. He does developmental and behavioural optometry and is the optometrist I've been recommended by several Wellington parents. He tested both children and said that while Iris has not yet developed short sight she has all 10 of the risk factors including a tendency to clench her eye muscles to do things very close to her face and so he's made her some glasses that make her relax her eye muscles and do things a bit further off. Using these glasses now should make her less short sighted in the future. They don't make it easier for her to see, they are making her learn to see in a better way. It's best if she wears them a lot and especially for concentrated close work. She doesn't need to wear them when she's running around outside. At the least whenever she wears them she is teaching her visual system how to relax. As well as using the glasses we can get her out and about or looking at the horizon and the moon when we notice she's been doing concentrated close work for a while. To support her I am wearing my glasses a lot more and Sean isn't going to be doing laser surgery for his eyes in the next little while. We are not going to force her to wear them but I've told her I'm not reading to her unless we're both wearing our glasses and, like a sun hat, I've been putting them on her when her hands are busy a minute after she's rejected them. Even in just one day I've learnt that if they're on they're fine and I should not fiddle with them. David Aldridge measured her sight today with her glasses on and said that her brain was already beginning to make the adjustments and that we should keep an eye out for behavioural changes (not putting things right up to her face and recognising people a bit further off) and come back in 2-3 months. Http://www.babousa.org/behvis.html is an interesting short explanation of behavioural vision care in general rather than for reducing myopia in small children in particular. As my eyebrows become heavier I'm thinking about building an organic and ornate gate-folly at the end of the path to the hole in the fence to the neighbours'. A tiny sliver of Gaudi's rocket cathedral fallen to earth and embedded among the green. Dead Wasp goes on an outing. We took Dead Wasp to Te Papa this morning. Iris carried Dead Wasp's pottle in her backpack with her current favourite bedtime book: Andrew Crowe's Which New Zealand Insect . Hazel wore the reins that I wore as a child and went on all fours because she was being a dog. She's such a good dog: obedient and intelligent, a delight to be with. We went to NatureSpace and put Dead Wasp under the microscope so that we could look at her intricate wings and intriguing ovipositor on the screen high above. We didn't find a useful person full of exciting new things to say about Dead Wasp, but Hazel and Iris didn't need that. They now know where to find a microscope that they can use and that they may look at their own specimens with it, that's empowering.